I’ve been more than a little obsessed with broccoli ‘bowls’ in recent months. I love cooking up a big batch of Beautiful Boiled Broccoli on the weekend to use during the week. It only takes 5 minutes to chop and 5 minutes to cook and it means I’m eating a lot more broccoli! Of course you don’t need to be that organized. You can easily cook your broccoli just before you eat as per the recipe below. This classic combo of smoked fish with sour cream and chives is so easy to pull together. Yet there’s enough interesting flavours and textures to keep you wanting more. Equally great as a simple dinner or lunch. Bring a small pot of salted water about 2cm (1in) deep to the boil. Chop broccoli into bite sized trees and slice stems. Simmer broccoli florettes, stems and leaves covered for 5 minutes or until no longer really crunchy. Drain and tip onto a large plate or tray to allow the steam to escape as it cools for a few minutes. Divide broccoli between two bowls. Drizzle over lemon juice and add flaked fish. Top with sour cream and chives and lots of fresh black pepper. WINE MATCH: A nice fresh Riesling or Sauvignon Blanc. vegetarian - Replace smoked fish with smoked almonds or cooked chickpeas. more substantial (carb lovers) - toss in cooked pasta or potatoes. more substantial (low carb) - add roasted almonds or other nuts. Or serve with poached eggs. herby / more veg - toss in baby spinach, salad leaves, parsley or even basil. dairy-free - use this cashew sauce as your sour cream. carnivore - replace smoked fish with bacon and replace sour cream with grated Parmesan and a good drizzle of peppery extra virgin olive oil. smoked trout or other smoked fish - freeze it. chives – best to use for another meal. Great finely chopped and served with fish. Yes! Just make as per the recipe but keep the sour cream and chives separately. Will keep in the fridge for 2 weeks or can be frozen (don't freeze the sour cream). Either serve cold or warm in a frying pan with a little oil. Watch video on You Tube. 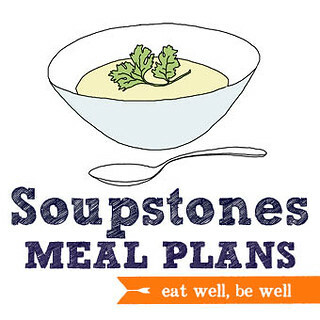 IIf you’re struggling with meal planning, then check out Soupstones Meal Plans. Jules. I did your smoked trout and broccoli bowl tonight as husband came home with stacks of broccoli! Amazing coincidence! It was fabulous … and so easy, did your yogurt and tahini sauce with it and added your toasted seeds and nuts. Thank you so much. I don’t read anyone other than you!! Does the broccoli need to be washed before boiling it?